Fall is without doubt my favorite time of the year. The air turns cooler after the heat and humidity of a North Carolina summer. You can smell the freshness of the woods on those cooler mornings, when the light breezes rustle the trees from the leaves. And, of course, you get those stunning colors that symbolize the coming changes in the weather. Umstead Park is one of the most gorgeous locations in the Triangle to take in the fall season. Situated between I-40 and Highway 70, the large state park is largely treed, with hiking trails transversing the entire park. It's also one of my favorite places to do family pictures. The park is large enough to provide ample opportunities for various backdrops as well as the chance to get away from the crowds that use other locations. Another great thing about the fall months is that the sun begins to hang lower in the sky. In this image, you can see the sunlight shining through the trees in the background. When the sun hangs low, the shadows we see become softer. During this session, I sat the young lady in the shade of the surrounding hardwoods, with the brighter background behind her. I had her place her left leg in front and slightly bent, with her back leg tucked in under ever so slightly. Her hands were placed in her lap and her head turned towards me. The lean in you see her doing was natural and all her. Her mom's clothing choice was exceptional for the day and season. Every piece of her and her clothing climbs out of the image as she is set against the much softer background. The rich colored tones on the forest floor transition nicely in contrast to the much brighter sunlit background. Using a off-camera strobe, I was able to blend her into the scene naturally, while retaining the great colors in the background. The soft light is generated through by shooting through a large modifier which is just to my right about 20 feet from the subject. And, since the sun hangs low, the background can be seen since it's well lit and not in shadow. Planning a fall photography is a little different from the summer. During the summer, the sun becomes a major factor and many times sessions are scheduled late in the day. By scheduling sessions then, you avoid the shadows, but at the cost of losing backgrounds when scheduled too late. In the fall, with the lower sun and less harsh shadows, anytime of day is fine for your pictures, so the emphasis becomes more about setting and background for the images. Combined with a little flash, your fall images will look perfectly natural and the time of day won't be apparent. 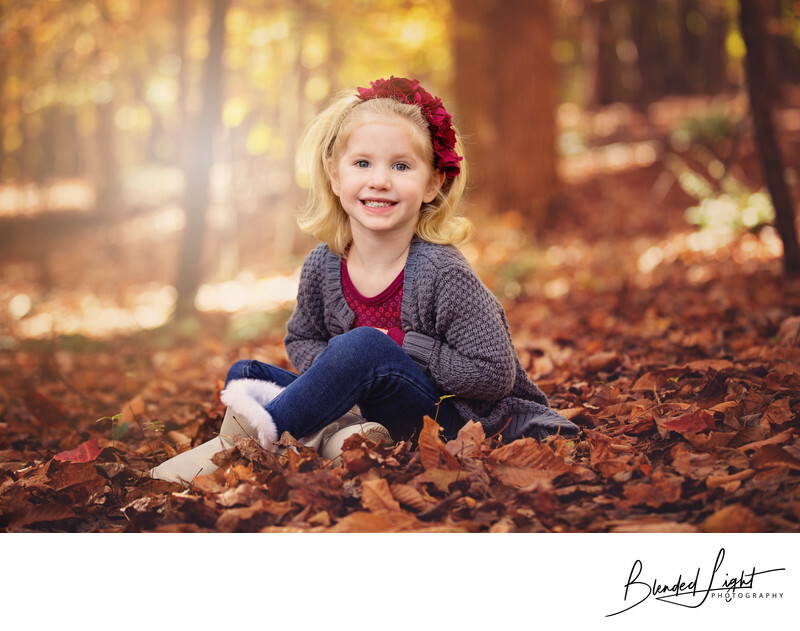 To schedule your spring, summer or fall portraiture session in Umstead, send me a email and let's find a perfect day for you. The park is an amazing location for outdoor activities regardless of the time of the year and I am confident you'll love the images we create together. Location: Umstead State Park, Raleigh NC. 1/125; f/2.8; ISO 200; 90.0 mm.